We are well into our first month of our collaboration with Sun Bear Outreach so we thought it was time to introduce you to the bears that you are helping when you shop with The Karma Collective. 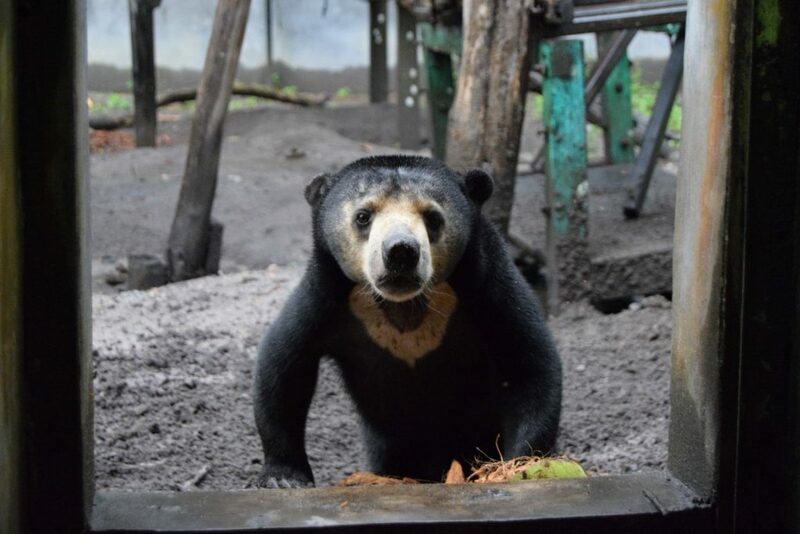 10% of all our sales from March – July 2019 will be donated to Sun Bear Outreach to help fund the building of a forest enclosure which will be the new home for four rescued sun bears in Indonesia. 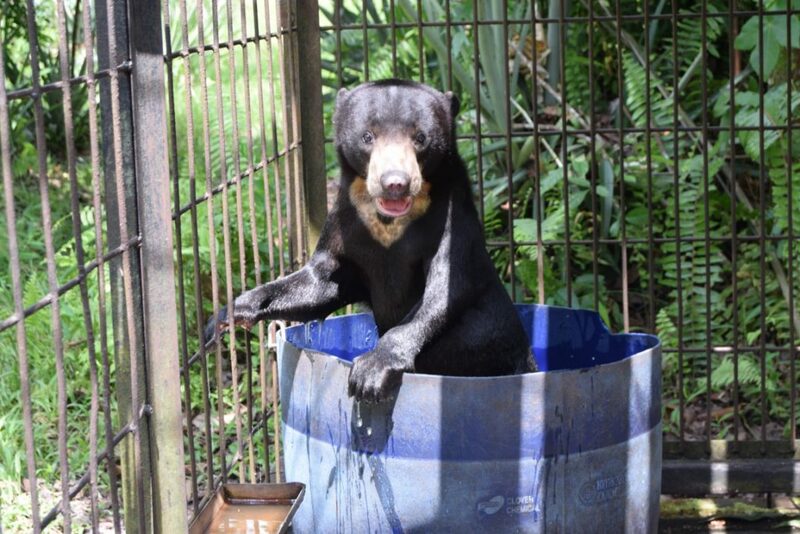 Sun Bear Outreach is an amazing organisation whose mission is to improve the welfare of captive sun bears. It is 100% volunteer run and it has already built several large forest enclosures in Indonesia, giving many bears a better life. For this new enclosure, the bears – Sunny, Hitam, Buddy and Cora – have each been rescued from different circumstances and are not able to be released back into the wild for various reasons. They are in the care of an organization called Orangutan Foundation International (OFI) in Borneo where Sun Bear Outreach has already built 3 enclosures since 2014. The new enclosure will be 2 acres big with 4 dens, built on OFI land. Here, Sunny, Hitam, Buddy and Cora will be able to lead a meaningful and comfortable life. Hitam is a lovely young lady who was brought to OFI January 2018. We think she was about five years old upon arrival. She had spent her formative years kept in a small cage as a pet. It’s quite common in the illegal pet trade industry for animals to be physically mutilated to reduce the risk of being able to harm their owners. Tragically for Hitam, her owner had all her canine teeth removed. Being kept in a small cage for several years has also resulted in other health issues for Hitam, such as hip dysplasia and underdeveloped bones. Understandably, Hitam is wary of strangers but she has a good bond with those who take care of her. She can be a little feisty when she meets someone new, but this is her way of making sure they are willing to put in the time to earn her trust. 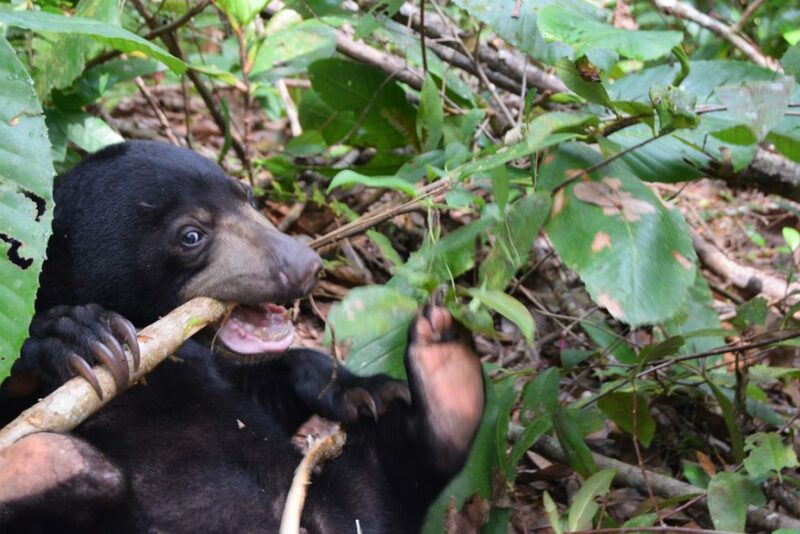 Hitam is super inquisitive and likes to study every inch of any forest log she is given. She can easily keep herself occupied for hours stripping bark from trees, layer by layer in the search of some ants to eat. She is a beautiful girl; her golden face never fails to bring a smile to those who meet her. Another victim of the illegal pet trade industry, Buddy was rescued from a wildlife trader in Jakarta. Buddy was just a baby bear cub, but he had already been mutilated. All of his claws had been forcibly removed. The reason? It would have made him an easier potential pet for someone and thus, easier to sell at a high price. Despite the hardships he has been through, Buddy still has a lust for life – he is super inquisitive, playful, and eager to learn. He constantly wants to play around and then cools off by taking a dip in his enclosure tub most days. Buddy’s favourite way to end the day is to go to sleep in his hammock, absolutely exhausted from all the play from the day. Finally, at the end of a long day, he will pass out in his tire hammock exhausted. But the next day he wakes up ready to do it all again. Despite his lack of claws Buddy still has an impressive set of teeth and puts them to good use by using them to open up coconuts. With no claws to help him, he has to get creative and drops the coconut on the ground again and again until he gets to the good stuff and enjoys the (literal) fruits of his labour. Cora is a still a tiny little bubba cub, she is hasn’t even turned 2 years old yet. She was brought in to the Care Centre of OFI when she was only a few weeks old. The villagers who brought her in said they found her abandoned in a den. She is super shy; an introvert and doesn’t trust easily, but she is very attached to the care givers who have earned her trust. Cora goes on daily forest walks but she hasn’t taken to the forest as quickly as most cubs do. It’s suspected that this due to the trauma she suffered early on. She can climb but it takes her a little longer than other cubs. She prefers to keep her feet on the ground most of the time. One thing she does love is searching for ant nests to disturb, it’ll keep her occupied for hours. Cora is a gentle soul who loves stability in her life. She is a beautiful girl who will flourish into a happy and confident young lady with the help of those who care for her. Sunny is just a wee little lad – he is only an itty bitty one year old. 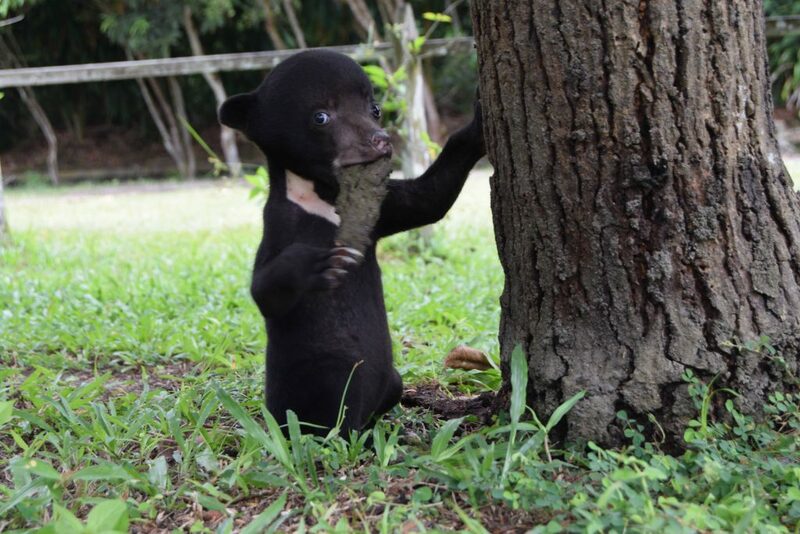 He was brought to OFI by the Forestry Department as an orphaned 2 month old cub, barely able to walk. When he arrived at OFI, he cried out incessantly but has since then earned his name, Sunny, with his sunny disposition – always looking on the bright side of life. He looooves milk and loves monkeying (or bearing?) around even more. He’ll happily stay out in the forest tearing bark from trees for hours. Being quite the copy-cat, Sunny learned how to climb by mimicking his best friend, Fitri. Quite the opposite to his little friend Cora, he is very social and enjoys playing with the other bears. He is a trend setter, making sure he is always first to explore any new enrichment items that is given to the bears. He is so positive and we are sure Sunny will be the life of the party in the new enclosure. So there you have it, an introduction to the beautiful bears who are waiting for their new home. Thank you for reading their stories and thank you for helping to give them a chance at a happy life. We can’t wait to give you updates on them once the project has been funded.